Sweet little evergreen shrublet with fine blue foliage. 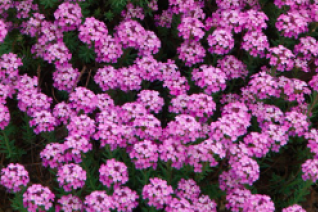 Atop a rounded form in spring, masses of light pink flowers are incredibly showy for such a diminutive plant. To about 8″ x 1′ forming a bun. This member of the brassica tribe is excellent in rock gardens or even on hot dry sunny slopes. Full sun and average, well drained soil. Light to little summer water. Blooms for 3-4 weeks in mid to late spring. Cut back hard after blooming- new blue foliage will flush out almost immediately. Troughs, rock gardens. Low care rock garden classic.